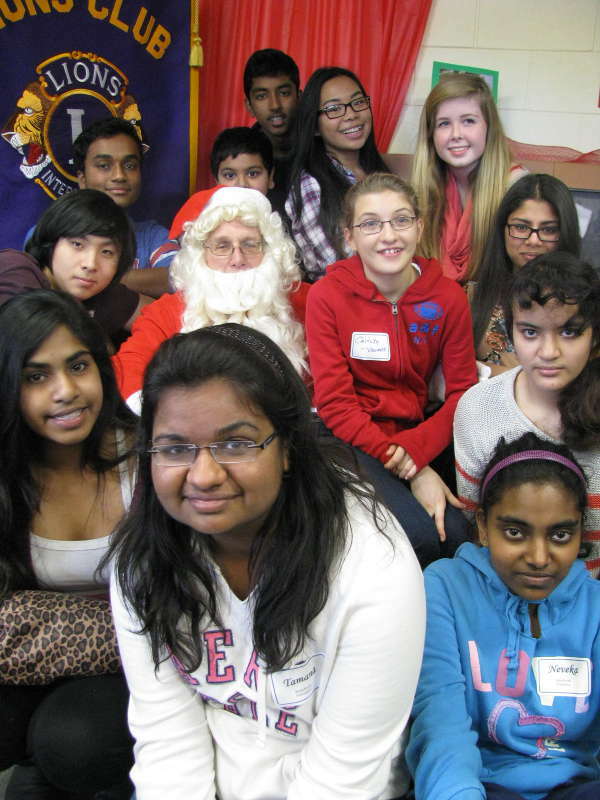 The West Hill - Highland Creek Lions teamed up with the West Hill Social Activity Club, the East Scarborough Storefront (volunteers pictured) and the Heron Park Community Centre to host their annual Breakfast with Santa. As usual, the tickets sold out quickly as over 100 children and their parent(s) came out for a pancake breakfast, presents and a photo with Santa. The West Hill - Highland Creek Lions hosted another successfull Holiday Craft & Gift Sale at the Heron Park Community Centre. With over 50 vendors selling to a large number of customers, everyone was kept busy. The Lions would again like to thank the local Country Style concession for donating hot dog & drink tickets to the club, who were able to sell them all by 1:00 PM. The Lions 50/50 draw also took in $320, with the winner taking home half that amount. The other half will go toward Lions projects in the community. 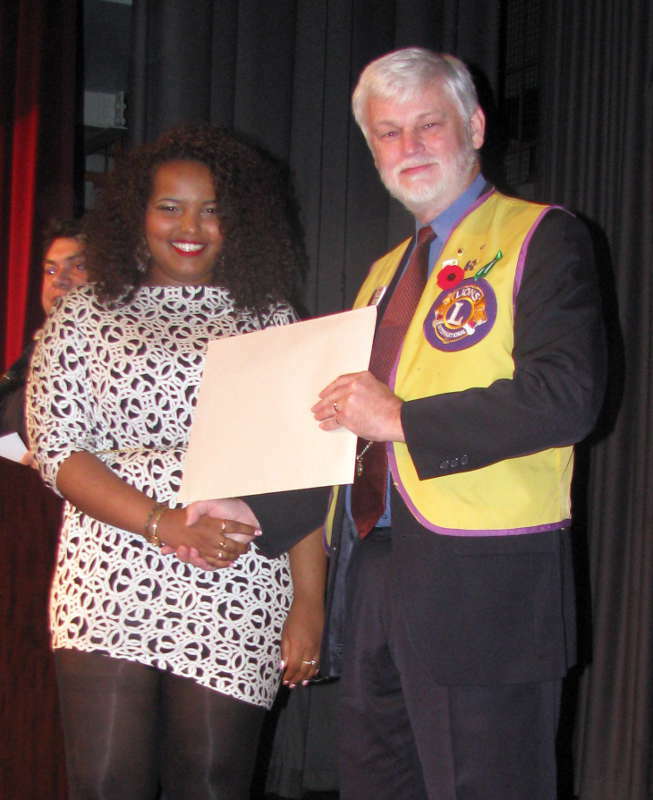 The West Hill - Highland Creek Lions presented its annual Community Service Award to graduating students at Sir Oliver Mowat CI, West Hill CI and Sir Wilfrid Laurier CI. The awards are given for outstanding volunteer work in the community to a graduating student who is going on to further education and who is not receiving any other awards. 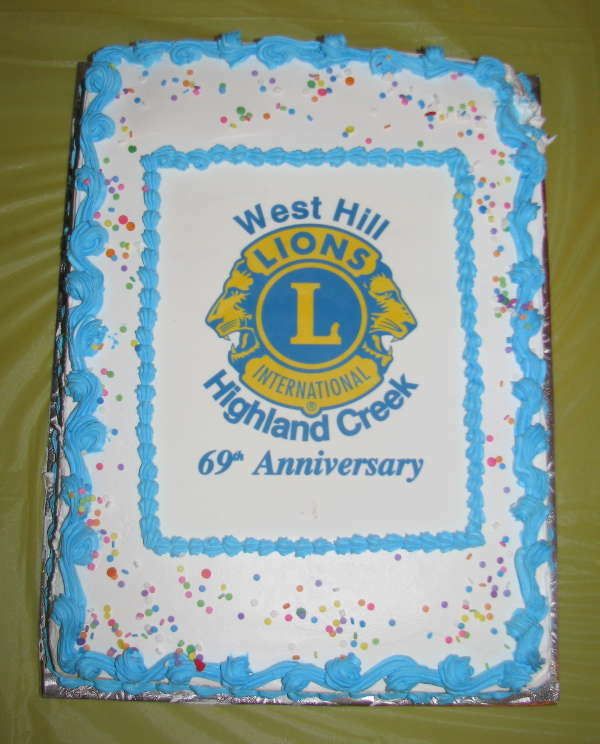 The West Hill - Highland Creek Lions held an open house at the Heron Park CRC to celebrate our 69th anniversary. 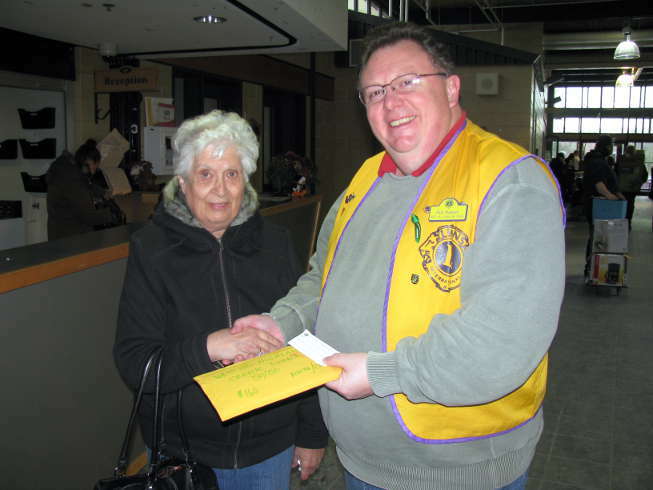 In addition to displays showing how the Lions have been active in the community since 1944, refreshments were served. And of course, what's any anniversary without a cake? The West Hill - Highland Creek Lions staffed an information table at the annual Italian Heritage Day festivities at the Scarboroough Civic Centre. The event is sponsored by the West Hill Social Activities Club who also operate out of the Heron Park CRC. 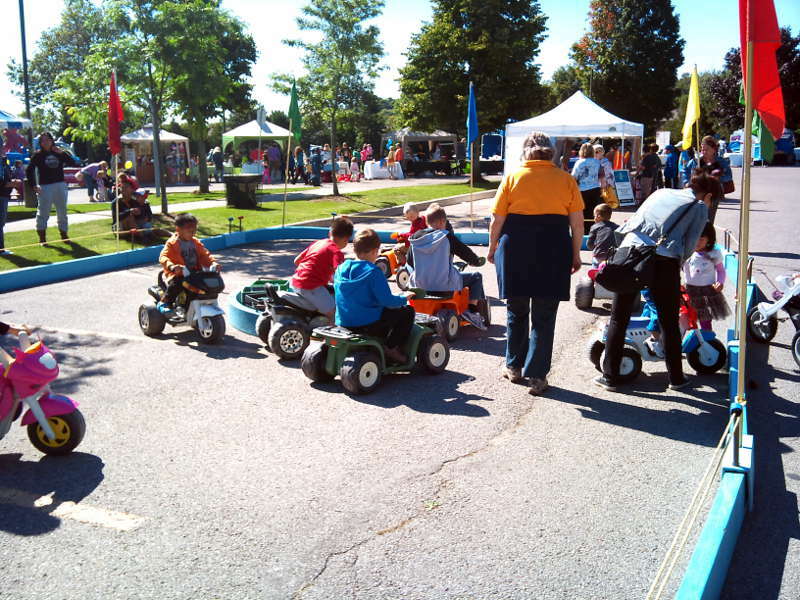 The West Hill - Highland Creek Lions once again helped out at the West Rouge Family Day by supervising the Minicircuit rides, flipping burgers and doing other miscellaneous jobs. We also held a 50/50 draw to raise money for the Dog Guides. 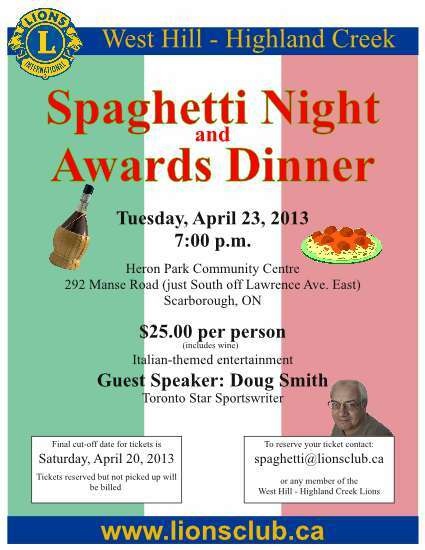 Our annual Spaghetti Dinner, this year featuring sports writer Doug Smith, was another great sucess with a large number of guests. We were pleased to present the Special Olympics swimming club with a cheque to support their activities. 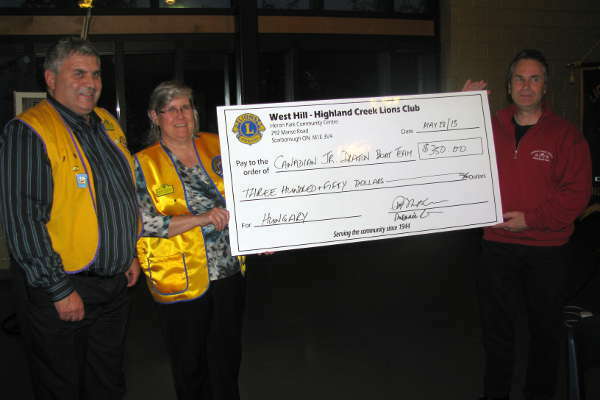 The West Hill - Highland Creek Lions presented a cheque to Canada's Junior Dragonboat Racing team to help them compete in the world championship being held in Szeged, Hungary in July. 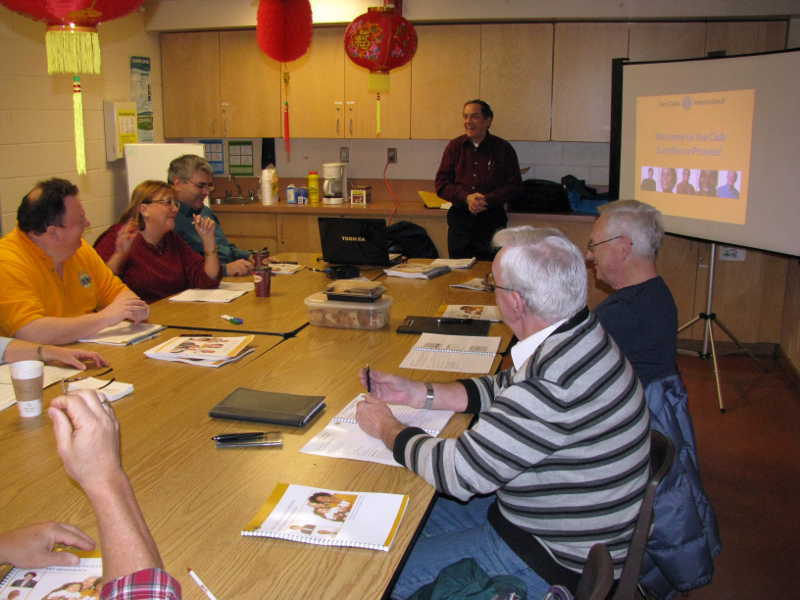 The West Hill - Highland Creek Lions met at the Port Union Community Centre to participate in a Lions CLub Excellence Program session moderated by Region 58 Chair Lion Bill Willcocks. The program is intended to help club focus their efforts to serve local needs more effectively. The West Hill - Highland Creek Lions teamed up with the City of Toronto and the Tam Heather Curling Club to put on Little Rocks curling at the Port Union Winterfest. This was the second time the weather has been consistently cold enough to make curling ice. 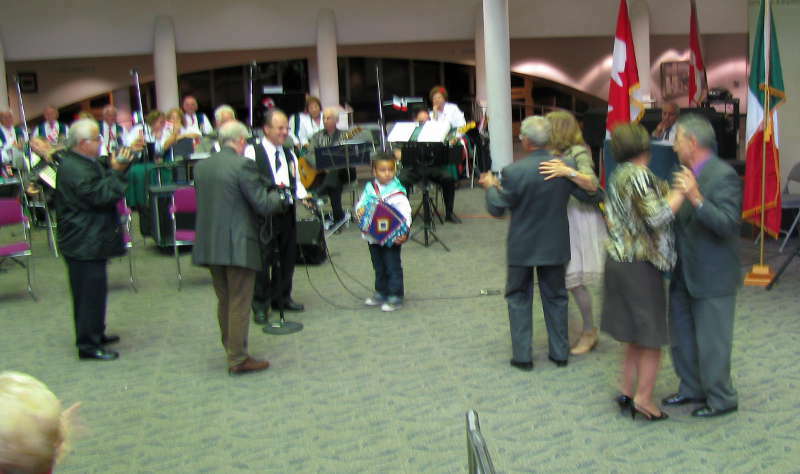 While aimed at children, the program was also popular with adults. A member of the Toronto constabulary is seen here trying his hand during a break in his duties. Lions volunteers also helped out in other activities at the Winterfest. The West Hill - Highland Creek Lions received a an appreciation certificate from Tam Heather's Bantam Girls curling team for their support of the team as they attempt to improve on their 4th place finish in last year's provincial finals. Team Paccanaro is one of several sports teams the Lions sponsor in this community.